Stephen W. Terrell's (MUSIC) Web Log: TERRELL'S TUNE-UP: The Mystery Lights! Thee Oh Sees! The Monsters! TERRELL'S TUNE-UP: The Mystery Lights! Thee Oh Sees! The Monsters! Practically all of those bands — from the lofty masters like The Sonics down to the pimpliest no-name Midwestern no-hit wonders — unabashedly tried to imitate African American hitmakers like Wilson Pickett and the Isley Brothers, and they did their best to mimic all those blues and R&B-soaked British bands like The Rolling Stones, The Animals, and The Yardbirds. The garage kids rarely, if ever, sounded as authentic as the performers they idolized, but the influence was obvious. So it shouldn’t seem all that surprising that the most prominent neo-soul label of the day, New York’s Daptone Records, would start an imprint (Wick) specializing in neo-garage rock. And knowing the integrity of Daptone, which has given the world Sharon Jones & The Dap-Kings, Charles Bradley, The Budos Band, and others, it's only natural that The Mystery Lights — the first band to release an album on the Wick label — would be a rocking delight. 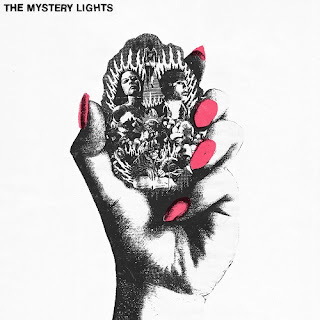 And though nobody is going to mistake Mystery Lights singer Mike Brandon for Lee Fields, there’s some true white-boy soul on the band’s self-titled album. 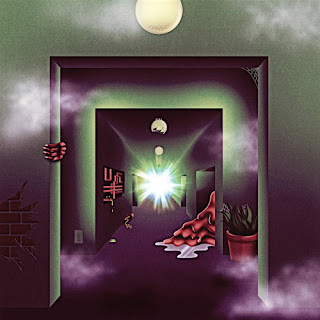 But even more interesting is when the Lights venture into the great cosmic beyond on psychedelic excursions like “Before My Own” and, especially, “Flowers in My Hair, Demons in My Head,” which features some tasty interplay between Solano’s guitar and the lysergic keyboards of Alex Q Amini. This kid probably didn’t spend all his free time studying David Cohen’s organ solos with Country Joe and The Fish, playing Electric Music for the Mind and Body over and over again until they haunted his dreams. But it sure sounds like he did. * A Weird Exits by Thee Oh Sees. You didn’t think we’d make it through the year without another crazy collection of songs from the world’s most prolific band, did you? Actually, this is their second album of 2016, but I haven’t gotten my hands or my ears on the first one, a live album. A Weird Exits shows a wider range for John Dwyer and crew than their last couple of albums did. But it’s the variety of sound that gives a punch to A Weird Exits. “Ticklish Warrior,” for instance, is lower and slower, showing echoes of the Melvins and the pre-synth The Flaming Lips. The spacey “Crawl Out from the Fallout” is downright dreamy, a seven-minute-plus ethereal soundscape with an edge of the blues. Then there’s “The Axis,” which is slow and surprisingly soulful, that builds up to an explosive, distorted guitar solo. Is this Dwyer’s attempt to rewrite “Free Bird?” Dwyer gives his throat a rest on a couple of psychedelic instrumentals here — “Jammed Entrance” (the closest thing to The Beatles’ “Tomorrow Never Knows” I’ve heard recently) and “Unwrap the Fiend, Part 2” (don’t ask me where Part 1 is), which features a classic Dwyer melody and a suitably screaming guitar. *M by The Monsters. It wouldn’t be Halloween without some Monsters, and the pride of Voodoo Rhythm Records is back with their second release of the year. “Let Me Spend the Night With Your Wife” is Beat-Man’s take on some imaginary Weimar Republic dirge. “Bongo Fuzz” is a classy instrumental featuring wild bongos. “Voodoo Rhythm” is a loving, growling homage to the record label Beat-Man built, while “Dig My Hair” is senseless blaring noise — and I mean that in the nicest way. I only wish that Edd “Kookie” Byrnes could have been around to sing this with The Monsters. I’m sure he would have lent Beat-Man his comb. But the best song on the record is “Happy People Make Me Sick.” I don’t know — it just makes me happy. The third installment in The Monsters’ 30-year anniversary celebration will be a tribute album soon to be released. You’ve been warned. It’s Halloween! It’s time once again for the annual Big Enchilada Podcast Spooktacular. 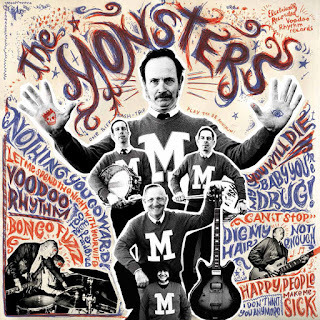 Hear an hour’s worth of spooky rock ’n’ roll, including a song from The Monsters’ new album. Follow this link and hear all my rocking Halloween podcasts. It’s all free — a public-spirited service to you, my readers.